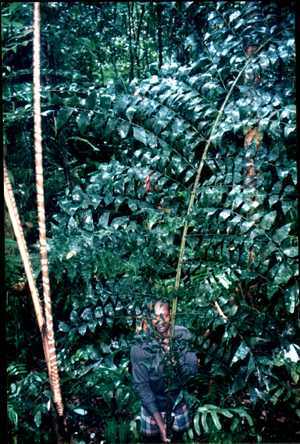 Description: - Habitat photo showing the lovely rounded leaf of Caryota zebrina "fishtail palm palm" from PNG and Irian Jaya. This is a small growing species that grows to around 10m tall, this species grows very well in the subtropics and can be grown in the full sun but looks it's best grown in filtered light,this species would make a fantastic landscaping statement just on it’s own,it seems to handle the cold very well and could possibly be grown as far south as Sydney. Growing Climate: -Will tolerate temps from 40C to 2C, grows best in a shaded position in a frost free area's and seems to handle most soil types but does best in well drained rich soils, watered 2 or 3 times a week with a nice thick mulch to help hold the moisture in soil, and fertilizer once a year in the warmer months.